First episode of 'Doctor Who'on T'/. Martin Luther King'l have a dream'speech. President John F Kennedy assassinated in Dallas. camera marked 'Lock' and 'Unlock' made it possible to change lenses wlthoul fogging the film, and locked up the shutter-release mechanism while you did it. The sieer utilitarian simplicity and versatility of the Mamiyaflex C was a breath of fresh air The bellows also made the Mamiyaflex a superb camera for close-up work, provided that a parallax correcting accessory called a Paramender was used to move the taking lens Into the position previously occupied by the viewing lens before the shot was taken. Close-up work could be carried out with any of the interchangeable lenses, although the 105mm f/3.5 was probably the best for the purpose. IN 1957, the Japanese company Mamiya launched a professional roll film twin-1 ens reflex camera unlike anything seen before or since. The Mamiyaflex C2 of 1953 fitted with 105mm f/3.5 Mamiya-Sekor lenses and with the 105mm frame finder in position over the hinged flap within the viewfinder hood. Once the image has been focused, the flap can be pushed down towards the screen and the sports finder used to frame the shot. 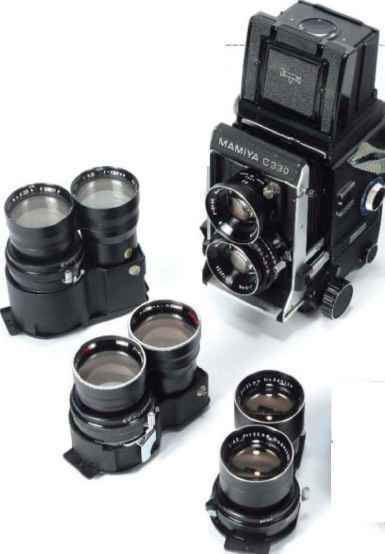 This is not totally necessary, but It may be desirable with action shots designed for interchangeable lenses, but neither was produced in quantity and neither seized the Imagination of the market in the way that the Mamiyaflex C series of cameras did over more than 35 years' production. 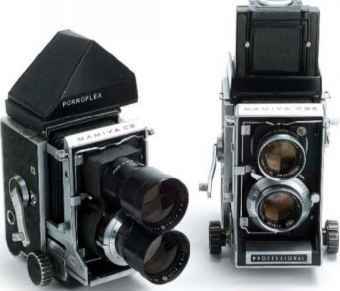 A Mamiya C3 (left) fitted with 180mm f/4.5 Mamiya-Sekor lenses and Porroflex eye-level viewfinder, and a Mamiya C33 with 105mm f/3.5 Mamiya-Sekor lenses and the standard folding viewfinder hood with magnifier arm that moved around the bass of the lens mount. This caused a problem for existing owners of the 1 SOrrm f/4.5 Mamiya-Sekor lens because the shape of the bock of the older lens mount fouled the cocking arm. A new version of the 180mm optic with a flattened profile to the back of the lens mount was announced at the same time as the C33, so you have to be careful, if buyirg now for a C33 or late; to get the richt lens. A sheet-film back for 6.5x9cm cut film was cffered for the Mamiyaflex C33 and there was also a replacement back for 220 film. The C2 was replaced in 1966 by the Mamiyaflex C22 This was a lighter camera for which there were Interchangeable tacks for 120 and 220 film. The C22 retained the knob wind and manual shutter cocking of the C2, but had double-exposure prevention. Then, in 1968, the C22 was replaced by the C220, still with manual shutter cocking but with automatic film counter reset. The wind knob on the C220 had a built-in fold-out crank and, with the advent of 55mm wideangle and 250mm telephoto lenses, the focusing scale on the side of the bellows base for the first time offered scales for all the focal lengths made for the Mamlyatiex range: 55mm, 65mm, 80mm, 105mm, 135mm, 180mm and 250mm. With the C220 was introduced a budget-priced standard lens, the 80mm 1/3.7 Mamiya-Sekor. mainly because it looked right'. The introduction of all-black lenses, without the bright steel shutter bezels of Mamiyaflex lenses made until about 1968, and a stylish overall appearance, made the C330 an endearing camera. However, the C330 did offer the considerable benefits of interchangeable focusing screers, automatic parallax compensation with all focal lengths and, for the first time, a frame counter that configured itself automatically for 120 or 220 film when the pressure plate was rotated to its 120 or 220 setting. This hugely benefited wedding photographers who, if they ran out of 220 film during a joD, could revert to 120 to finish it. In 1972, an upcraded version of the C330 appeared as the C330f, and the C330 and C330f were manufactured side by side until tne original C330 was discontinued in 1974. The three key differences were that the C330f had a single-action focusing hood, which is much easier to use; a focusinc lock that was absent from the C 3 30; and a filmtab holder asa film reminder. The C330f was produced until 1982. Two final versions of the Mamyaflex appeared in the early 1980s The rarely seen C220f, with the automatic exposure counter changeover from 120 to 220 when the pressure plate was rotated was followed in 1983 by the C330s, a successful and even more rugged development of the C330f with larger focusing knobs, a bet:er rear door latch and stronger stud mountings fcr the camera strap. The C330s eventually ended its production run in 1994. 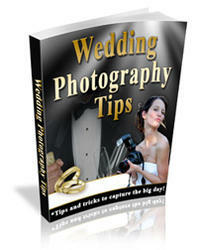 As a wedding photographer, you spend a lot of your time focusing on the business side of it. 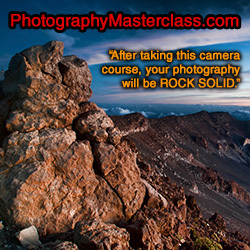 You want to provide your clients with the most beautiful pictures and you want to turn a profit for yourself. Beyond that, though, you should think about some other things. For example, as a photographer, you should know why someone should hire you over having his or her Uncle Vinny take charge of the photographs themselves. When was the mamiya c330 discontinued?